Our FOCUS Team has been doing some spring cleaning and sprucing up our website! If you haven’t stopped by in a while you might notice a few changes and some improvements to help you stay informed about FOCUS! Visit us today at www.focusproject.org. Here at FOCUS we just love celebrating all the important moms and dads out there for all they do to support their families and keep them strong! This month, we salute all the fathers of our Military Children! Thank you for all that you do! During times of stress, each family member may have different feelings and perceptions of the same event. Similarly, each family member may need different kinds of support. Read this article published in Military Press Magazine for some great tips to help your loved ones feel supported during stressful times. A guest blogger asks the big question! What is FOCUS? The FOCUS Blog is featuring a new series of posts from a former Marine Public Affairs Officer who also happens to be a Military spouse and mom! Her delightful posts really capture what it was like for her family to discover FOCUS and how it helped them grow and become closer! Check out the first post in the series here. 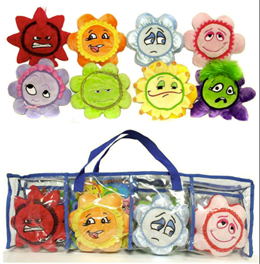 The Flower Feelings are a great teaching tool for the classroom and at home. The colorful and engaging plush allow children a tangible way to embrace their feelings while the activities included in the kit provide parents and teachers with many ways to create a safe and positive setting in which children can express their emotions. Click here to learn more about this new resource! Visit FOCUSProject.org for more information.